Runners from Pennsylvania claimed top honors at the Bull Run 50 Miler Saturday in Clifton, Va., but when the first 100 finishers were counted, the entrants who identified with the South were the team champions. Of the 325 runners who started the race, 282 had finished roughly 13.5 hours after the 6:30 a.m. start. In terms of the individual finishes, it was a testament to the collegial nature of ultra running that when Jim Blandford crossed the Bull Run 50 Miler finish line in first place, he credited the guy who won last year. From the point where he took the lead roughly eight miles into the race, he never trailed on course that heads north on the Bull Run Trail to Bull Run Regional Park and south toward Occoquan and the “Do Loop” before returning to Hemlock Overlook Regional Park in Clifton. The course, in contrast to many eastern ultra courses, was not terribly technical nor hilly in the estimation of several ultra veterans at the race. “I knew if I could get through the ‘Do Loop’ without anyone in front of me, I thought I could keep the lead,” Blandford, of Hamburg, Pa., said. He was one of many Pennsylvanians to make the trip, many of them members of the Reading-area club the Pagoda Pacers. From northwest of Reading, Lock Haven, Pa. resident Ashley Lister claimed the women’s title in 7:56:04, ahead of Megan McGrath‘s 8:12:25 second place finish. Lister started out with the intention of taking the race easy and spent the first half on her own. After catching up and integrating into a group of four other runners, her spirits improved and she went on to take the title, a year after being shut out of the race’s lottery. She and her husband David met while serving in the Marines, and their 12 hour shifts as security guards while stationed at Quantico helped them adapt to long hours on their feet in the middle of the night, preparation for ultrarunning. 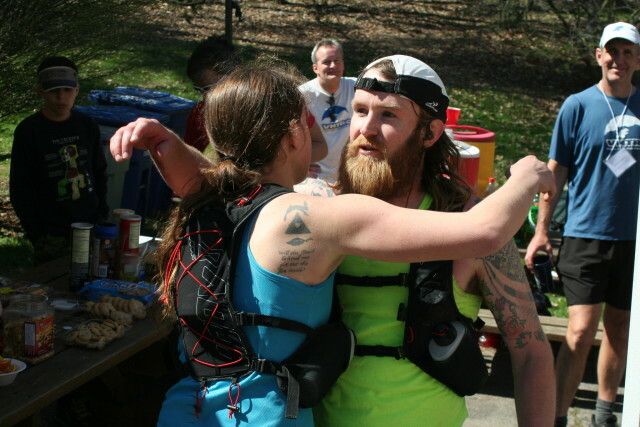 He usually finishes ahead of Ashley, but temperatures cresting 60 degrees got to him, and she passed him around mile 40. He remains confident heading into late June’s Western States 100 mile race in Colorado. Many runners used the Bull Run race as preparation for the Massanutten 100, a mid-May race at the Massanutten Resort in Rockingham County, Va. 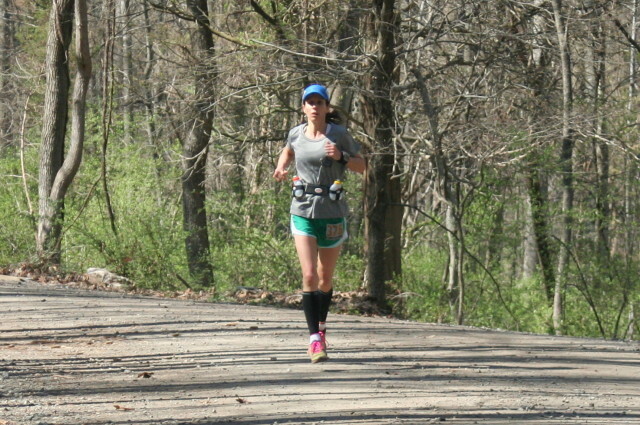 Both races are managed by the Virginia Happy Trails Running Club. Keith Knipling, of Alexandria, ran Bull Run despite his professed lack of training, finishing nearly 90 minutes behind his best time on the course, but said it would be silly to turn down the chance to run the race. Sean Andrish, of Leesburg, runner up in 7:06:46, remarked that the course was in wonderful shape, despite some mid-week rain. It had been a few years since he had run the race, and he was only slightly dismayed that his favorite aid station no longer offered ice cream sandwiches. He ran with a group of Bull Run rookies and tried to offer his experience. Charlottesville’s Rebecca Weast noticed that trap during her first Bull Run 50, the first 50 miler in which she ran the majority of the race. “You wouldn’t think it would be that hard, but without hills to walk up, you don’t get any breaks,” she said. Seeing her boyfriend, who was working an aid station, helped buoy her spirits. Phil Lechner, another Pagoda Pacer, said that experience for Weast was just right.